What happens now that the indoor season is over? We will continue to train in the Fieldhouse and surrounding area, as identified by the event coaches, until the end of April. No additional payment is required for the outdoor season. Your event coaches will guide you as to when you will be training. Please be patient with all that may be involved with the move to the new track, as this is the first time for all of us. How long will training continue in the summer? U12 - U14's: training will continue to be offered on Tues/Thurs until the the Provincial Outdoor Championships June 15/16. and/or the provincial Sole-stice meet (June 22). U16 - Masters: training will continue to be offered throughout the summer and until Aug. 14. Typically, athletes will continue training until the final event of their season, and then take some time off. The coaches will speak individually with athletes about the length of their spring/summer training. What outdoor events are there? RIVA will be sending coaches to most of the following meets. Please consult with your coaches to determine which meets/event to enter and how to qualify for the various competitions. year (8 - 13 yrs). RIVA athletes will be volunteering at this meet. Aug. 9 - 11 National Youth U16 & U18 Championships, Sydney N.S. Please see the invite attached for the upcoming Bob Adams Foundation event which recognizes performances by all Masters Athletes in Track and Field. Deadline to RSVP is March 5th. Event takes place March 23rd. Riversdale Athletics’ Road to Kenya group was featured on Global news.....Thank you to everyone who has supported this group so far. The group continues it’s fundraising efforts with a bottle drive tomorrow am - if they’ve missed you, you can donate by using the Sarcan drop and go program and use the code “Kenya2019” The group is also selling 50/50 tickets. You can PM/or comment below and I can get tickets to you. Draw date January 14th Thanks!!! On Dec. 26th Riversdale Athletics lost one of their best. Doug Boyd, long time coach, mentor, and friend passed away after a brief illness. Doug’s passing leaves a hole in the Riversdale family that will be impossible to fill. To us, Doug was a friend, coach, and mentor to many. On the track, he desired to see his athletes reach their full athletic potential. Off the track, Doug desired to see his athletes make the world a better place. In the months to come, Riversdale Athletics Club will be searching for ways to honor Doug Boyd. It is our desire to keep his legacy alive. Outside of Riversdale Athletics, Doug was a husband, a father, a grandfather, a brother, a friend, an elementary school principal, and so much more. Doug touched so many lives. For those who are interested in celebrating the life of this great man, Doug’s Memorial Service will be held at The Neighborhood Church (233 Pinehouse Drive), on the morning of Saturday, January 19. Track and Field needs you! We have an opportunity for you to watch track & field athletes up close at meets by being part of the Officiating Team. We have a number of exciting jobs at long jump, high jump and throws or on the track. An Officials clinic can start you on a life time experience as part of the sport of Athletics or can be a short term way for you to support our sport while your children are participating. Your RIVA Coaches will be communicating the Christmas/NewYear schedule that applies to your training group. What events to register for? Please consult your coach(es) prior to registering for events in order to optimize performance and reduce the chance of injury. The preparation leading up to competitions is specific to the events that are planned for the athletes and the meet schedules influence the events that are realistic for athletes to enter. Thanks for your cooperation. Volunteer commitment: Each meet that is offered to our athletes requires hours and hours of volunteer time and effort. Riversdale is proud that our families are a part of that volunteer commitment. Each family has a 10 hour commitment to fulfill. Rhonda Tremblay is our volunteer coordinator who will be contacting you with volunteering opportunities. -Different event groups and age categories will attend different away/travel meets. Please speak with your coach about which meets are applicable to you. - You must ensure that the athlete's name you enter is exactly the same as the name you used in registering your athlete with the club. On October 11 we are hosting an important RIVA meeting that we hope all can attend. At 7:30, in the Clubhouse at the Gordie Howe Sports Complex, we will have our annual kick-off night where we formally introduce our 2018/19 coaches and board members. Following these introductions, a financial statement will be presented, as well as two new members added to our Board of Directors. Some may refer to this formal 10-15 segment as our yearly AGM. RIVA clothing samples (hoodies, warm-up gear, competition singlets, etc.) will be available for individuals to size up and order. New to this year, tables will be available for a “swap meet” where individuals can sell their gently used clothes, track spikes, etc. If you are wanting to sell such items please email in advance riversdaleathleticsclub@gmail.com. *** For those who want a “sneak peek” of the new outdoor T&F facility that we will be training and competing at starting Spring 2019, please come early. Starting at 6:00 PM, a 30-45 minute guided tour will be given exclusively to our track club. This will include the opportunity to be some of the first to test (walk or run on) our new “Olympic quality” track. This $62 million multi-sports complex is going to be amazing...and we will be some of the first to visit this project. The tour will start and end at the Clubhouse, which is our meeting location. This is the same building we held our 2018 RIVA Awards Banquet. When arriving, please use the parking lot located off Avenue P South (in between the Gordie Howe Kinsman Arena and the Gordon Howe Campsite). If you have any questions regarding this evening, feel free to contact us. We hope to see you all there. Attention all current and perspective Riversdale Athletics Club Families! We would like to extend an invitation to all of you to join our Board of Directors and Coaches for a “Come and Go” Ice Cream Sundae Social “Meet and Greet” on Thursday, Sept. 6, 6:30 - 8:30pm (Meeting Room #1, Saskatoon Fieldhouse). 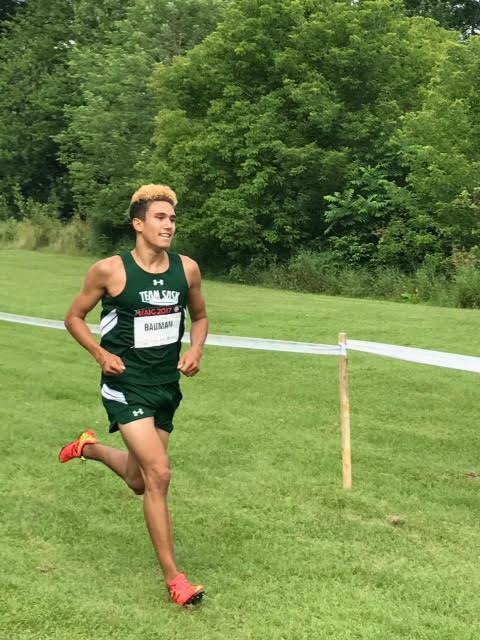 The information for the 2018 Cross Country season is now available. Please click HERE for the information package. - 6 weeks of entry level run, jump and throw activities. The coaches will also be available during the Sole-stice meet (June 5). As 2017 draws to an end for the Riversdale Athletics Club, the new year promises many athletic competitions and challenges for our athletes. The first of these is the 2018 Downtown Lions Sled Dog Open. This indoor competition will be held on January 12-13 at the Saskatoon Fieldhouse. The name you use must be the one that you are registered with at SK Athletics. This is the name you must consistently use as you register for each meet. (ie: Robert vs Bob; or Jennifer vs. Jenn). In the drop down menu for “Team” you must choose Riversdale Athletics Track (RIVA). We understand this process may not be a possibility for some of our families. Therefore, during the first week of January, we will be setting up a table at the Fieldhouse to do the remaining registrations. The exact date(s) and time will be determined shortly. In the meantime, we encourage those who are able to, to sign up online. Congratulations to the Riversdale cross country group. 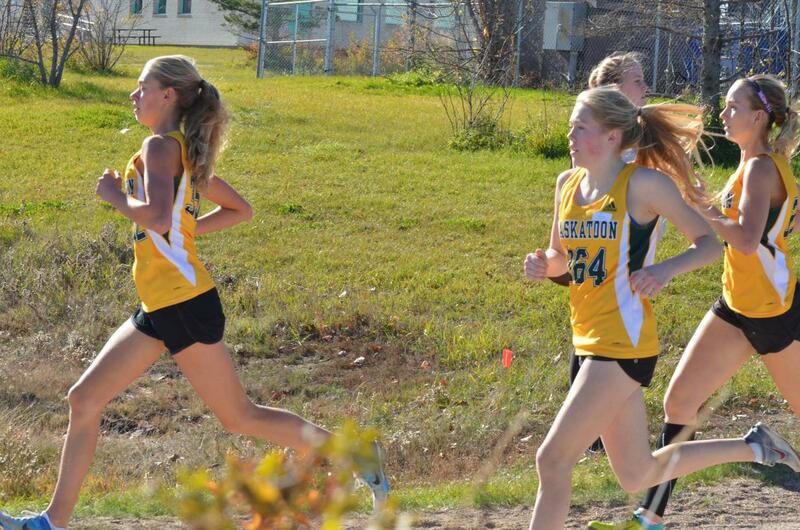 Twenty - one athletes qualified from the Saskatoon City Championships or another District Championship for the High School Provincial Championship that was held on Saturday, Oct. 14 in Turtleford. 3 medals, 9 top ten, 4 top twenty, 2 top 30 and 2 top 40 . Registration is now open and can be done through our join us tab. The official registration night is September 12th from 7-9pm at the field house. If you have completed a registration online you do not need to come to the registration night but it is a great time to ask questions if you have any. We will be holding an AGM at the Field House on October 3rd from 7-9pm. The AGM is a great time to meet the coaches, board members, and ask any questions you may have. There will also be clothing there for you to try on if you wish to order Riversdale Clothing. The information for the 2017 Cross Country season is now available. Please click HERE for the information package and HERE for the season schedule. 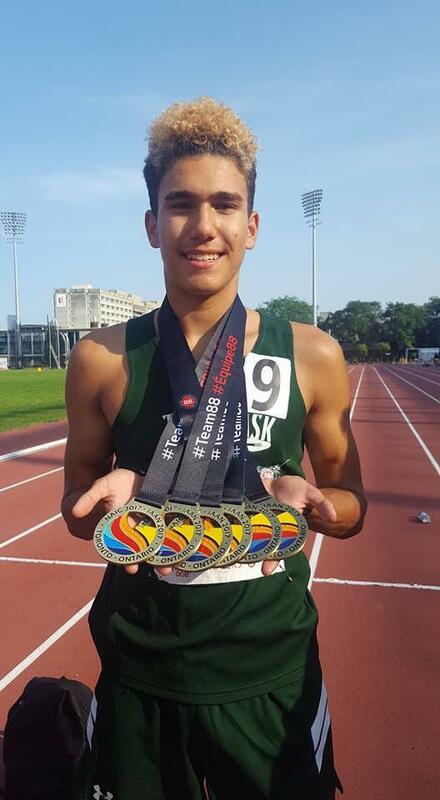 Dylan Bauman had 3 gold performances in his individual events at the NAIG Championships in Toronto. (3k cross country,1200m 3:28, 2000m 6:12.05). RossAnn Edwards takes part in an Apprentice Coach Program at ALTIS a world class training environment for athletes and coaches in Phoenix,AZ. This is also the training environment where Andre DeGrasse trains. Entries for the Knights of Columbus Meet (Jan.26, 27 and 28) are due this Friday. I will be at the track on Wednesday and Thursday from 5:00 till 6:30 to take fees and event requests. I have attached a VERY TENTATIVE schedule of events. We had a great showing at the Sled Dog Meet. Let's keep the momentum going. For anyone who hasn't yet picked up a singlet, I will be at the track with a selection of sizes before the meet on December 3. You can pick one up from me then. Please remember, if you haven't paid for one yet, that they are $60 each. Attached you will find the brand new 2016-2017 Handbook. It is full of information about our fees, schedules, volunteer requirements etc. Riversdale clothing orders can now be purchased. An email has been sent to all members with instructions for how to order. Deadline to order is November18, 2016. If you did not receive an email please use the contact for and we will resend. Four of these athletes will be travelling to Kingston, ON. to compete in the National Youth/Jr./Sr. Cross Country Championships on November 26th. The 2016-2017 online registration is now live. To register go to the Join Us tab at the top of the page and follow the instructions. Once finished you will be emailed a confirmation email that contains payment instructions. Riversdale Cross country for all ages begins on August 31 behind Lakewood Civic Center. If you are registering for Riversdale Indoor track, there is no fee for cross country. As a non-profit organization we attempt to keep registration fees as low as possible, accordingly we ask our members to fundraise to help offset the cost of Field House fees, equipment costs, and coach's travel costs to out of town meets. Fundraising is mandatory for all families who join Riversdale. Since all athletes benefit from the dollars raised through fundraising efforts, Riversdale has implemented a mandatory commitment of $200.00 per family, a fee which you have already paid at registration. Here's the good news, all or part of that fundraising commitment can be reimbursed to you by participating in Riversdale fundraising opportunities. Currently the purchase of gift cards is our main source of fundraising and a convenient way to do your grocery shopping. Between now and Monday, May 16th , we will offer CO-OP Gift Cards as a fundraising opportunity. Every $25 purchased in cards is worth $25 from CO-OP (excluding liquor or purchase of other gift cards). The biggest selling feature of the CO-OP gift cards is that they are redeemable at any participating CO-OP in western Canada and can be used for groceries, fuel and hardware. Cards are available in convenient denominations of $25 (i.e. $25, $50, $75, $100) In order to get your $200 returned, we will earn an 9% rebate of the total amount purchased, provided we sell $10,000 worth of cards (it is lower if we don't meet this min. ), and 10% if we sell over $15,000. Please invite your family members and friends to participate. Each RAC family's rebate is recorded, and rebates are returned to you by mail after the end of the track season in June. Note that once a family has successfully earned its $200 rebate (the amount equal to the obligatory fundraising fee), rebates earned over and above this amount will be split 50/50 with RAC allowing you to further reduce your fees! To summarize, it's simple math: To receive your full $200 rebate from selling gift cards, you can sell $2225 worth of gift cards at the 9% rebate level or $2000 worth of gift cards at the 10% level. We won't know what level we'll receive back until we get a sense of the sales - I'll keep you posted. Theoretically, this is about 2-3 months' worth of groceries and gas (paid for in advance) for the average family of four. Sell these to yourself and you'll have your $200 back, lickety-split. Sell some to family and friends if you don't wish to front the cash and reduce your overall fees. (You are under no obligation to participate in this current opportunity or any future gift card opportunities). Email Karen Toews @: kkd@sasktel.net with your orders and I'll set up 2 -3 days at the track or Griffiths where I'll collect the funds in the 3rd week of May. Please include your name/athlete's name, and the amount of CO-OP Gift Cards you wish to order and the denominations you'd like to receive them: $25, $50, $75, $100, etc. CO-OP Gift Cards will be delivered in the 4TH week of May. Once again, I'll set up at the track a few days so you can pick up your cards. The maximum amount of gift cards that Co-Op allows with this fundraiser is $20,000 . Last time we did a gift card fundraiser we raised $14,500 but I'm assuming this will be more popular. So, please send me your orders quickly so you aren't left out. I'll be taking these orders, first come, first served basis. Thank you! Send questions my way. Congratulations to all award winners from our Riversdale Awards night. Below is a listing of all award winners for the 2015-2016 season. Monday, April 11 from 6 - 7pm in meeting room 1, Saskatoon Fieldhouse. Coaches will be dismissing athletes early so they can attend this session. Alison Friesen, Sport Dietician with the Sport Medicine & Science Council of Sask will be presenting valuable information on what to eat and when, before a competition; how to eat when you have multiple events in a competition day; recovery foods and healthy eating and hydration for an athlete. All Riversdale athletes and parents are welcome. There is no charge for this session. Riversdale will be honouring some accomplished and well-deserving athletes with awards on the evening of Sunday, April 24, 2016 at 5:00pm at the Saskatoon Club. To start the evening, a buffet dinner will be served, with awards to follow. The Saskatoon Club is located at 417 21st Street East. All new and past athletes and families are welcome to attend! The Saskatoon Club dress code for this event is smart-casual. Please click on the Padlet link below, indicating your names/phone # and the number attending. You may pay for the parents and siblings at the door ($20/each), but our athletes attend at no charge. It is imperative that we can guarantee a number attending to the Saskatoon Club, so please sign up no later than Monday, April 18th. If for some reason you must change your plans and cannot attend after signing up, please let me know immediately at kkd@sasktel.net or 306-221-9976 as we have to give a guaranteed number to the venue. If you reserve spots for the dinner, but fail to attend, our club will be on the hook to pay for your meal, so please let us know if you cannot make it, no later than Monday, April 18th. Captured gold medals in the 50m and 60m hurdles and long jump at the Canadian Masters Indoor Championships in the Women 55+ Age Class. Set new records for the Canadian Masters and Sask Athletics Master Women 55+ Outdoors in the 80m hurdles, long jump & triple jump. Ranked fifth in the world and first in Canada for Indoor long jump and pole vault. Ranked sixth in the world and first in Canada in Outdoor pole vault. Ranked tenth in the world and third in Canada, and new Sask Athletics record holder in Master Women's 55+ in the 60m. The Regina Indoor Championships and PeeWee/Bantam Provincial Indoor Championships will be held in Regina on February 12 and 13. It takes place at the Regina Sportsplex, 1717 Elphinstone Road. The cost is $20 per individual event and $30 for triathlons and pentathlons.I will be at the track this Wednesday and Thursday from 5:15 to 6:30 to collect entries and fees. If you can't make it to either of those times, please contact me to make alternate arrangements. Entries received after midnight, Sunday, February 7 will be charged a late entry fee of $30 per individual event and $40 for triathlons and pentathlons. It would be great to see as many people as possible make this trip, especially our peewee and bantam athletes. No hotels or buses have been booked so athletes are responsible for their own transportation and accommodation. Car pooling is a good way to get to know your fellow Riversdalians. Congratulations to Payne Wylie for his outstanding performances (high jump, hurdles, 60m, 200m) in the Knights of Columbus meet. He was named the Sask Age Class Athlete of the Meet and awarded the 2016 William A. Reid Award. The first meet of the new year is coming up. It is the "Downtown Lions sled dog Open" on the 14th, 15th and 16th of January. They are offering events for all age groups. For a complete list of events, go to the PR Athletics web site (prathletics.com). I will be at the Field House this Tuesday and Wednesday (Dec. 22 and 23) from 5:15 to 6:30 to collect registration fees. As usual, the cost is $20 per event. Please let me know if you can't make it to either of those dates. Speak to your coaches if you have questions about which events you should enter. Hopefully just in time for Christmas, we can now order Riversdale clothing online from Xtratime Sports Soccer Locker. Simply sign on to this website: soccerlocker.ca. Hit the XXSL Club button, and hit the LOGIN button. Once logged in, click on the Riversdale Track Club icon and it will take you to the shopping page where you can add items to your shopping bag, etc. Upon check out, you will then create your own account and use a credit card to complete the transaction. If you do not wish to shop in this way, simply visit the store and give them your order in person. They are at 477 2nd Ave. North. (306) 244-8933 and Shaun or John has been our contacts. Orders must be placed by December 8th in order to arrive by Christmas! The first indoor meet of the year will be on Dec. 5. Registration fees are $20 per event or $30 for the triathlon (Tykes, Pee Wees, Bantams). I will be at the track on Monday, November 23 and Wednesday, November 25 from 5 to 6 pm to collect registration fees. All fees must be paid before an athlete will be registered for the meet. Please talk to your coaches about which events, if any, you should be participating in. As a non-profit organization we attempt to keep registration fees as low as possible, accordingly we ask our members to fundraise to help offset the cost of Field House fees, equipment costs, and coach's travel costs to out of town meets. Fundraising is mandatory for all families who join Riversdale. Since all athletes benefit from the dollars raised through fundraising efforts, RAC has implemented a mandatory commitment of $200.00 per family, a fee which you have already paid at registration. Between now and December 7th, we will offer Sobeys Gift Cards as a fundraising opportunity. Every $100 purchased in cards is worth $100 from Sobeys (excluding liquor or purchase of other gift cards). Cards are available in convenient denominations of $25, $50, $100 or $250. In order to get your $200 returned, each participating family will earn an 8% rebate of the total amount purchased, provided we sell $10,000 worth of cards (it is lower if we don't meet this min.) Please invite your family members and friends to participate. Each RAC family's rebate is recorded, and rebates are returned to you by mail after the end of the track season in June. Note that once a family has successfully earned its $200 rebate (the amount equal to the obligatory fundraising fee), rebates earned over and above this amount will be split 50/50 with RAC allowing you to further reduce your fees! To summarize, it's simple math: To receive your full $200 rebate from selling Sobeys gift cards, you can sell $2500 worth of gift cards. Theoretically, this is about 3-4 month's worth of groceries (paid for in advance) for the average family of four. Sell these to yourself and you'll have your $200 back, lickety-split. Sell some to family and friends if you don't wish to front the cash and reduce your overall fees. Additional opportunities to sell gift cards will hopefully be available in the new year as well. (You are under no obligation to participate in this current opportunity or any future gift card opportunities). Email Karen Toews @: kkd@sasktel.net with your orders and I'll set up 2 -3 days at the track where I'll collect the funds in the first week of December. Please include your name/athlete's name, and the amount of Sobeys Gift Cards you wish to order and the denominations you'd like to receive them: $25, $50, $100, etc. Sobeys Gift Cards will be delivered in the 2nd week of December. Once again, I'll set up at the track a few days so you can pick up your cards. There will be no track Nov 11 due to Remembrance Day. 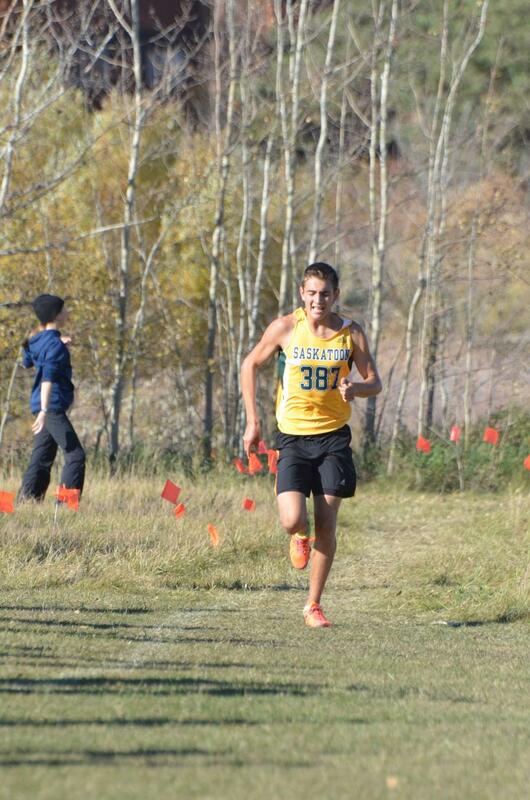 Images for the cross country season can be found in our photo gallery, here. So far it has been a very successful track season. We have had some really good results from our cross country runners and base training is getting the rest of our athletes ready for the indoor season which starts on the 2nd of November. The coaches will let the athletes know the details of training times etc. That being said, it is my experience that sometimes important information doesn't make it home from the track. In order to make sure all our athlete's parents have all the information they need we will be having a Parent's Information Night on October 29 at 7 pm in meeting room 1 at the Saskatoon Field House. This is your chance to meet the coaches and the Board and have any questions answered. We will be covering topics such as fundraising and volunteer opportunities, track etiquette and safety (especially important for rookies),clothing and footwear and meet schedules and travel options. We will also be taking half an hour to hold our annual AGM where we will present our budget for the year and elect our next Board of Directors. I encourage all parents to come to the meeting. Even if you think you have all the information you need, it is a good time to meet some of the other parents and become a bigger part of the Riversdale Athletics community. I look forward to seeing all of you on Thursday. The Bob Adams Foundation is pleased to invite Saskatoon School Students to Griffiths Stadium to meet this outstanding athlete. For information regarding base training time and locations please view the list below to find information for your group. Developmental group: venue- the Weir on the university side, Tues. and Thurs, 4:30pm from Sept. 15 until indoor sessions begin. Pole vault: September 21st, 4:30pm, Griffiths or the fields outside. General prep will start Sept 21 at Griffith's @ 4:15. An email will be sent out by Dale to his group as the date gets closer as it may change. Tentative start date: Sat., Sept. 26, time TBD, venue - Gabriel Dumont Park, email Joel Senick for further details. Registration and the first practice will take place on Monday, August 31 at 4:30 pm behind the Lakewood Civic Centre. Registration night will be held at the Saskatoon Field House on Sept 8th and 9th. To make the process as smooth as possible you can register ahead of time on our Join Us page. At the time of registration you can tell us your name and we will have all the info needed to process the payment. Additionally, you will be required to submit your payment and medical forms on these days. Athletes cannot begin to train until we have both the payment and the forms.